I’m a coffee lover–as long as it’s good coffee and it’s brewed properly. 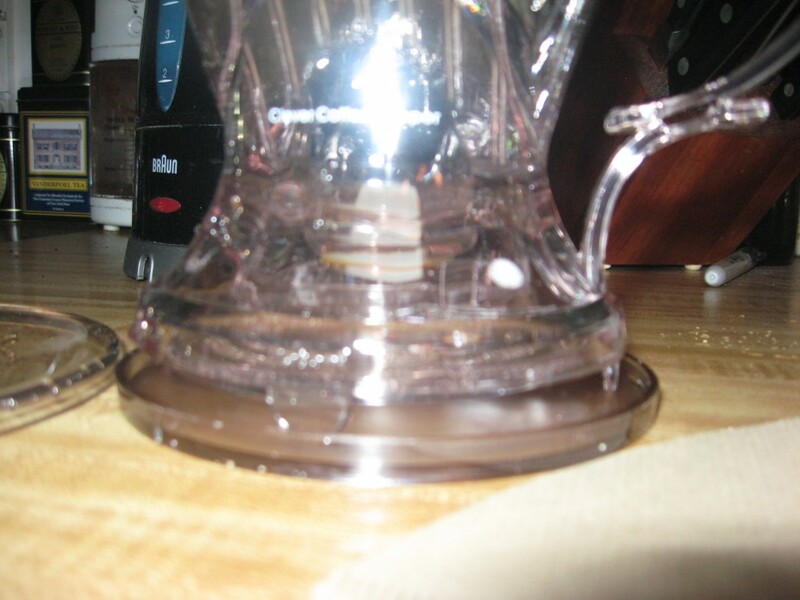 That leaves out a lot of brewing methods, including the automatic drip coffee maker. 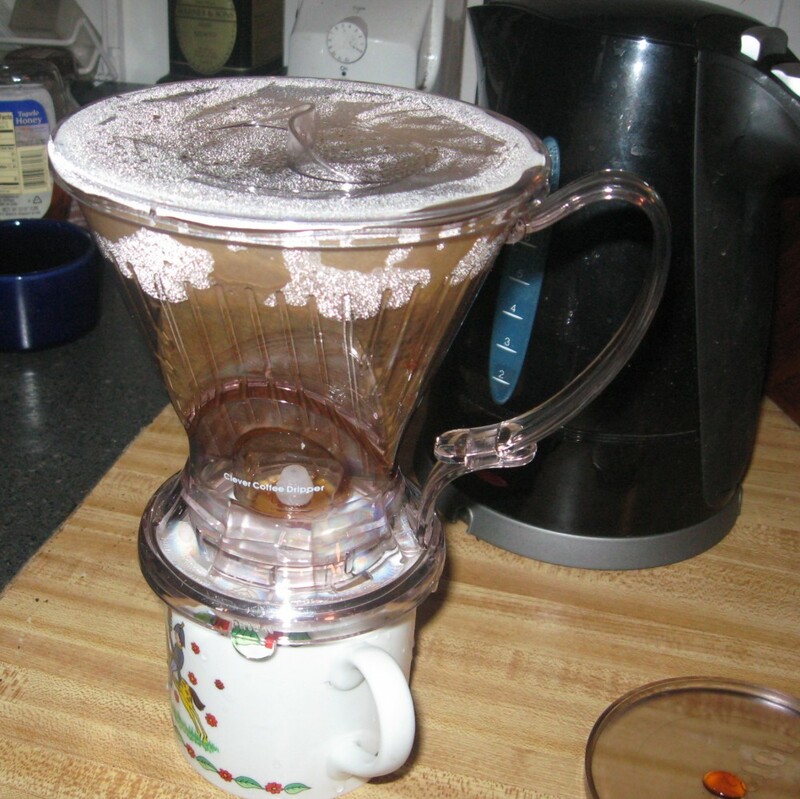 I’ve tried different ways of brewing coffee (other than the standard drip coffee maker): Bodum vacuum coffee maker which I do like a lot but is not functional for work days; the Filtron cold-water brewing which makes great iced coffee in the summer, Chemex, Melitta, and, of course, a French press. I like the flavor of coffee from the French press, but the sediment just sets my teeth on edge for some reason–otherwise, the French press is my favorite coffee maker for flavor. When I got my last issue of Cooks Illustrated (first of this month) I noticed that they had good things to say about something called a Clever Coffee Dripper. I’ve seen a lot of coffee brewing systems reviewed in Cook’s Illustrated; it usually comes down to them recommending the French press. I was surprised to read that The Clever Coffee Dripper was labeled “a success”. Curiosity and my dislike of the sediment in French press coffee finally got the better of me and on Friday I ordered a Clever Coffee Dripper. I found it most inexpensively from Amazon.com; the price that Cook’s Illustrated quoted from that supplier plus the shipping was higher than I wanted to pay, so I googled the Clever Coffee Dripper. Amazon’s price was a bit higher, but the shipping was less, so I ordered it from there. Over the weekend I had an e-mail saying that it had been shipped. I’ve been waiting rather impatiently for it to arrive. On my way home from work today I stopped at Harris Teeter and got some #4 cone filters, in hopes that it would arrive today. On this wet, gray, rainy day I was thinking hot chocolate, but I found a package outside my door–the Clever Coffee Dripper had arrived. For an instant or two I contemplated waiting until morning to try it out–but that was really only a quickly passing thought. I knew I had to try it now! 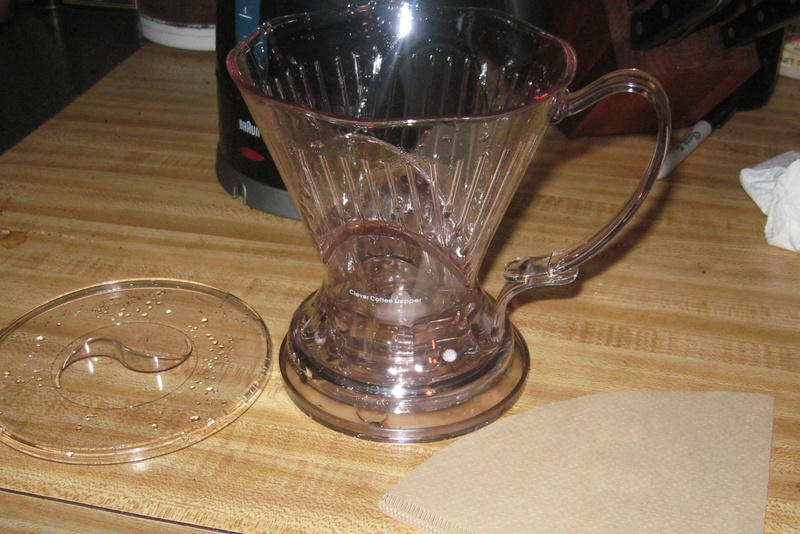 It’s a very simple apparatus: a funnel-shaped top that looks like a Melitta or filter-cone coffee brewer, but with a few extra parts: a coaster for it to rest on, and a lid and a stopper/valve that is opened when it is set on a cup or carafe. I filled it with water and checked to see if it leaked (it did not) and how quickly it drained without a filter or coffee grounds in it (it drained much more rapidly than the Melitta filter-cone). I plugged in the kettle and ground some coffee while that was heating. I used a medium drip grind as the instructions said that too fine and it will drain too slowly; too course and it would drain too fast. I’m not sure how much of an issue that is since the water and the grounds stay together in the cone. According to the instructions on the box it will fit on anything with a diameter between 1-1/2 inches and 3-3/4 inches. That means it will fit on my thermal carafe. I got out my widest coffee cup to test that–also means my biggest coffee cup. 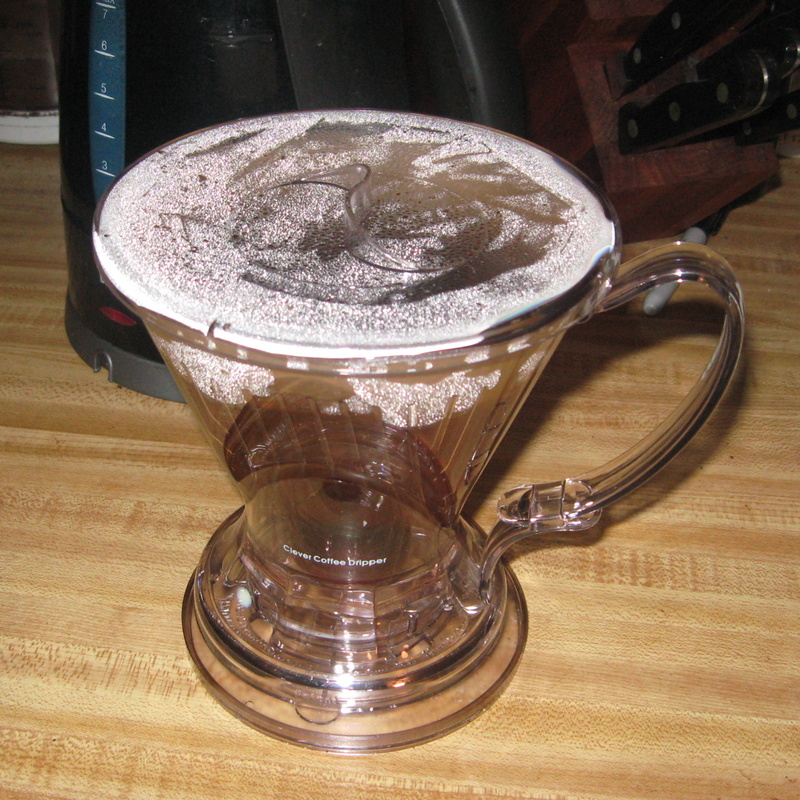 The instructions said to put in the filter and rinse to minimize the paper taste–which is something that I did even with the Melitta. I filled my coffee cup with hot water to warm it. The brewing time is essentially the same as the French press–but the instructions say to stir it after 1-1/2 minutes, then continue to brew for 4 minutes. After the proper amount of time, I set the thing on my coffee cup and watched it drain. I did follow the instructions, and I got a good cup of coffee! I haven’t done a side-by-side test with the French press, but to me this tasted like French press coffee without the sediment. No sediment, and easy to clean up. Definitely a keeper! This is not going to make a lot of coffee at one time–unless you want to brew into a carafe–and brew several times. As Cook’s Illustrated indicated–it’s for small amounts of coffee. The heat loss during the standing time is about what you’d expect from a French press (unless you have the double-walled one). Overall, it seems to be a good prospect for my morning coffee–easy and tasty!